Most young adults say they know what they want, in terms of the field in which they want to have a career. The fields they most mention are medical, management/business, and technology/IT. 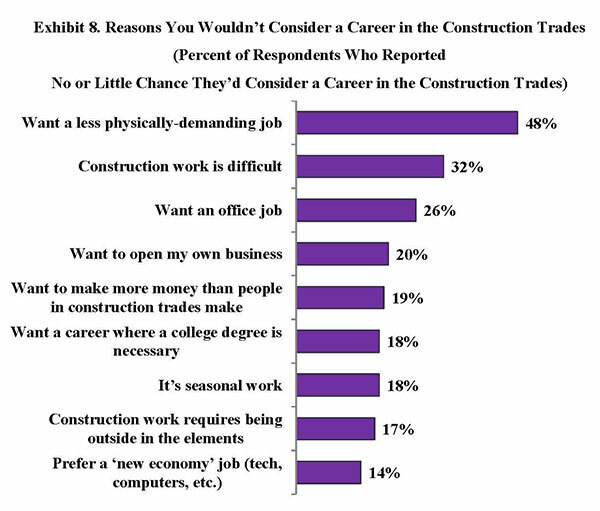 Relatively few, however, mention the construction trades. 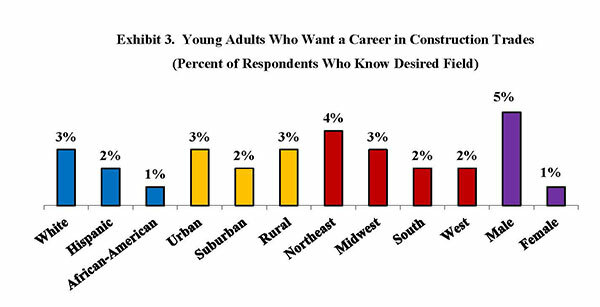 This low propensity to desire a career in the trades extends across young adults of different racial/ethnic groups, regions of the country and even across urban/suburban/rural boundaries. Among the few who do envision a career in the construction trades, the most important benefit of this line of work is good pay, followed by the view that it provides useful skills. In contrast, many of those who say there is no or little chance they would work in the trades attribute it to wanting a less physically-demanding job and to the notion that construction work is difficult. The above are some of the findings from a recent NAHB poll of 2,001 young adults, ages 18 to 25, conducted online by Morning Consult in November 2016. Participants were selected to be representative of the population in this age group across race/ethnicity, gender, and region. The primary objectives of the analysis include shedding light on the attitudes of young adults toward the trades, the compensation level that could entice some of them to join the industry, and the reasons some will not even consider it as a possible career path. This research project was developed in response to the severe labor shortages currently affecting the home building industry nationwide. In a recent survey, more than 8 out of 10 single-family builders identified the cost/availability of labor as the most significant issue they will face in 2017. The current scarcity of construction labor is all the more concerning given projections from the Bureau of Labor Statistics that the construction sector will add around 790,000 new jobs in the decade leading up to 2024. 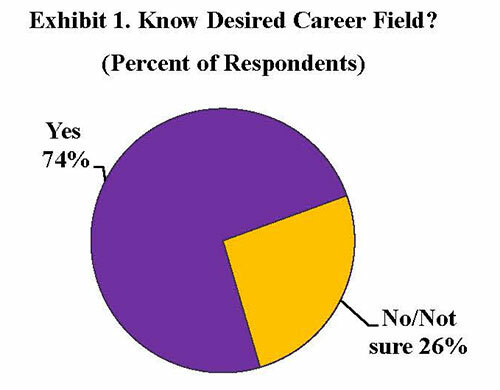 The majority of young adults in the survey (74 percent) responded affirmatively to a question about whether they know the field in which they want to have (or already have) a career, while the other 26 percent said ‘no’ or ‘not sure’ (Exhibit 1). There was no significant difference in how different subsets of young adults (across racial/ethnic groups, gender, or regions of the country) answered this question: over 70 percent know their desired career field, regardless of demographics or geography. If Have Career Plans, What Are They? A follow-up question to the 74 percent who know the field where they want to work asked about what specific field they have in mind. The three most commonly mentioned are medical (16 percent), management/business (12 percent), and technology/IT (9 percent). Another 7 percent want to be engineers, 6 percent each want to be involved with science or teaching, and 4 percent each want to work in marketing, law, or the media (Exhibit 2). A remarkably low number – 3 percent – want to work in the construction trades, matching the share that want a career in the performing arts or the government, and barely ahead of the 2 percent who are interested in a military career. Twenty percent of young adults said they have other careers in mind, such as design, non-profit, psychology, hospitality, social service, or counseling. It is important to try to figure out if different groups of young adults feel differently toward a career in the construction trades. Exhibit 3 has the answer: the share of 18-25 year olds who want to work in the trades is in the low single-digits across all the variables analyzed. For example, across racial/ethnic groups, only 3 percent of White, 2 percent of Hispanic, and 1 percent of African-American young adults say that is the career they want. The share is identical among rural and urban respondents – 3 percent. Regionally, it is at best 4 percent in the Northeast. Few young adults of either gender say they want to work in the trades, but the share is somewhat higher among men (5 percent) than among women (1 percent). There may be many possible reasons why people choose a particular career path, but the survey listed seven reasonable, common-sense options and asked respondents to indicate how they came about their field of choice. For 76 percent, it is simply what they are most interested in, while for 47 percent it is based on their skills/qualifications. Twenty-nine percent chose their field because it has the best career opportunities and 22 percent because it offers the best paying jobs person can get. Only 16 percent said it is because it is easy to find a job in the field, and fewer than 10 percent said it has anything to do with family or friends (Exhibit 4). How about young people who want to work in the construction trades specifically? What drives them to make that choice? The same things as for all fields in general: it is what they are most interested in (63 percent) or it is based on their skills/qualifications (48 percent). About a quarter also say the trades have the best career opportunities. Meanwhile, what the family wants or where the friends work both have very little to do with young adults’ choice to work in the construction trades. A relevant question for those who want to work in the construction trades is the benefits they see in this career choice. Results show that the two most important benefits are good pay (cited by 80 percent of this group) and the view that it allows them to obtain useful skills (74 percent). At least half also mention three other benefits: career success relies on skills they already possess (58 percent), it allows them to work outside (53 percent), and it gives them the ability to start their own business (50 percent). The majority of those choosing to work in the construction trades don’t do it because it does not require a college degree or because it is seasonal work (Exhibit 5). If Have No Career Plans, Any Chance Young Adults Would Consider the Trades? The follow-up question for the 26 percent of young adults who did not know in which field they wanted to have a career was one of chances hedged on pay. In other words, this group was asked about the chance they may consider a number of fields for a career, using a scale from 1 to 5, where 1 meant ‘not a chance I will consider the field no matter the pay’ and 5 meant ‘very good chance I will consider the field if pay is high’. As it turns out, the three fields undecided young adults are most likely to consider –depending on pay– are management/business (with an average rating of 2.7), technology/IT (2.6), and medical (2.4). Of the 14 fields listed in the survey, construction trades ranked in ninth place, with an average rating of 2.1 and 63 percent of the undecided rating it a 1 or a 2 – i.e. no or little chance they would join the trades regardless of pay. About 18 percent did rate it a 4 or 5 though, meaning the chance was good to very good they would consider joining the trades if the pay was high enough. 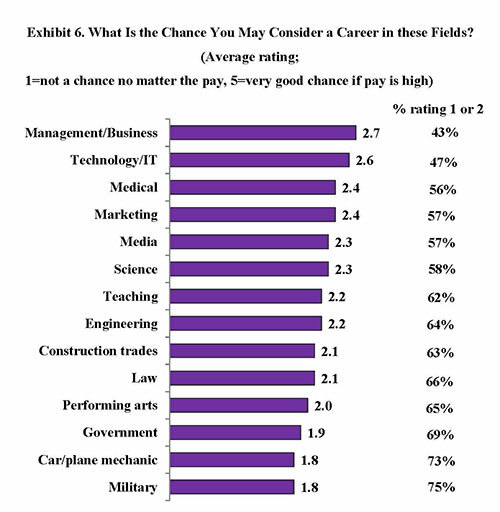 While fields such as marketing, media, science, teaching, and engineering also have better chances than the trades of attracting undecided young adults, it is worth noting that several other fields (like the military, car/plane mechanic and the government) rank lower than the trades and have even lower odds of luring them with good pay (Exhibit 6). 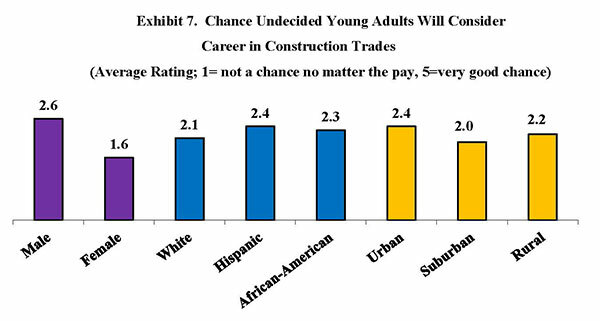 A rigorous analysis of these data across demographic groups shows that some undecided young people may be more willing than others to consider working in the construction trades if the pay is high. The most significant discrepancy is across gender lines. Whereas men’s average rating is 2.6 (remember, 1=not a chance no matter the pay, 5=very good chance if pay is high), women only gave it a 1.6. Basically, this means that monetary incentives will be far more effective enticing men to enter the construction trades that they would be with women. Similarly, undecided Hispanic (average rating 2.4) and African-American (2.3) young adults are slightly more likely than their White counterparts (2.1) to consider working in the trades if the pay is high enough. The same is true for young people living in urban areas (2.4) vs. those in suburban communities (2.0) (Exhibit 7). The 63 percent of undecided young adults who indicated there was no or little chance they would consider a career in the construction trades no matter the pay were prodded about the reasons for their resoluteness. Cited by 48 percent of this group, the most important reason is that they want a less physically-demanding job. The second reason is that construction work is difficult (32 percent); the third, that they want an office job (26 percent). 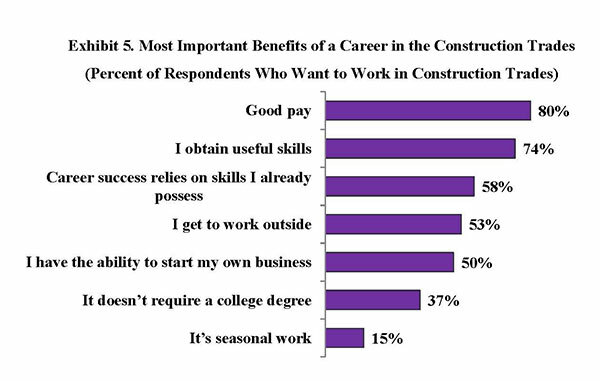 As shown in Exhibit 8, the remaining reasons are less important deterrents: 20 percent said the reason was that they want to open their own business, followed by want to make more money than people in the construction trades (19 percent), want a career where a college degree is necessary (18 percent), it is seasonal work (18 percent), construction work requires being outside in the elements (17 percent), and prefer a ‘new economy’ job (14 percent). The undecided young adults who were definite about there being no or very little chance they would join the construction trades regardless of pay got another follow-up question: what level of annual compensation would increase the chance that you might reconsider? As Exhibit 9 shows, 43 percent of this group remained consistent and affirmed that they would not consider it at any level of compensation. The other 57 percent, however, disclosed the paycheck figure that would make them give the construction trades a second thought: while only 7 percent would reconsider it for a salary of either $40,000 or $50,000, the share triples to 22 percent if offered $75,000, and to 21 percent if the offer was for $100,000 or more. A breakdown of this data by gender shows that men would be significantly more willing than women to accept joining the trades for an annual salary of at least $75,000: 52 percent of men would reconsider at that point, compared to 37 percent of women. 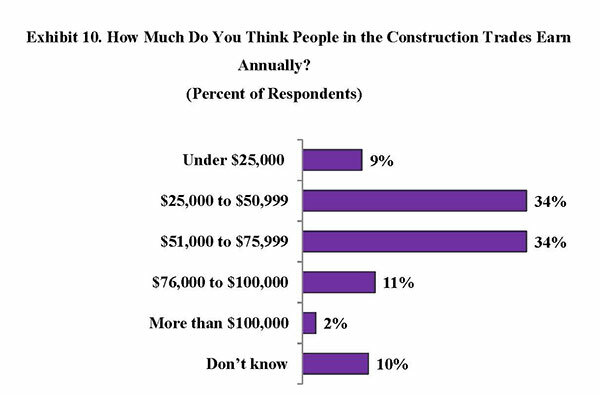 In order to more concretely understand young adults’ perception of the financial benefits of a career in the construction trades, the survey asked how much they thought people in the construction trades earn annually. Ten percent said they didn’t know. Of the other 90 percent, 9 percent think the figure is under $25,000; 34 percent think it is between $25,000 and $50,999; another 34 percent between $51,000 and $75,999; 11 percent between $76,000 and $100,000; and only 2 percent think people in the construction trades can earn upwards of $100,000 a year (Exhibit 10). Summarized in one number, young adults think the typical (median) salary of a person in the trades is around $56,150 a year. The share of young adults who think annual salaries in the construction trades can top $75,000 is low and does not vary significantly across gender, racial/ethnic, or urban/rural groups, ranging from 11 percent to at most 14 percent. How Much Do Construction Occupations Pay Now? 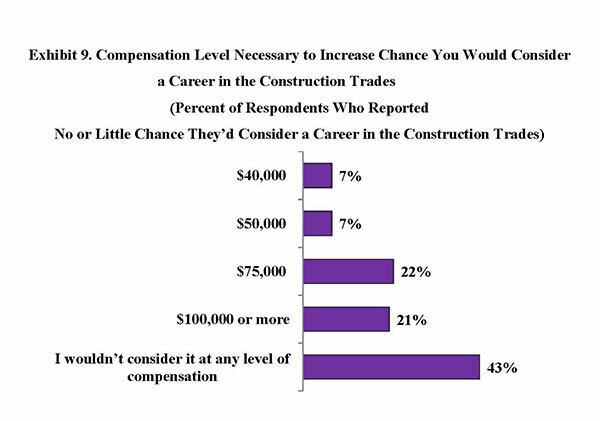 The above findings provide clear evidence that an annual compensation level of $75,000 or more would likely lure more people into a career in the construction trades. This deduction brings up an important and relevant question: are there currently any jobs in the construction sector with average wages of at least $75,000? The latest Occupational Employment Statistics (OES) from the U.S. Bureau of Labor Statistics (BLS) show that average annual wages are currently less than this for construction workers in all occupations relevant to the home building industry, but there are a number of occupations where the top one-fourth of workers do earn at least $75,000, especially in certain parts of the country. For example, although the national average earnings for First-line Supervisors of construction workers is below $75,000, the top one-quarter of these supervisors earn at least $75,000. At the state level, the top one-fourth of supervisors earn $75,000 or more in 27 states, followed by Plumbers, Pipefitters, and Steamfitters (the top quarter of whom earn $75,000 in 14 states) and Electricians (10 states) (Exhibit 11). The states with the highest number of housing construction-related occupations where the top one-fourth of workers earn at least $75,000 are New York and Illinois (each 16 occupations), followed by Massachusetts, Hawaii, and New Jersey (10 each). At the very high end of the profession, the top 10 percent of workers often earn more than $75,000. 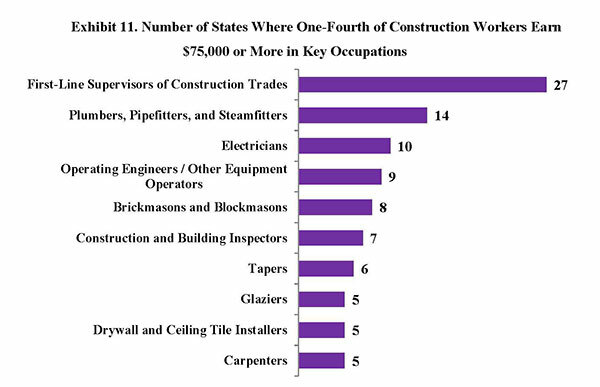 At the national level, the top 10 percent of construction workers in all ten of the occupations listed in Exhibit 11 earn more than $75,000, and the same is true for carpet installers. Also, experience in the construction trades is often a necessary intermediate step on a career path toward a management or executive position in a construction company, or toward owning and operating a trade contracting business. There are over 400,000 trade construction businesses in the U.S. (plus another 2 million if you count the small ones without paid employees). Earnings of the self-employed are not covered by the OES. 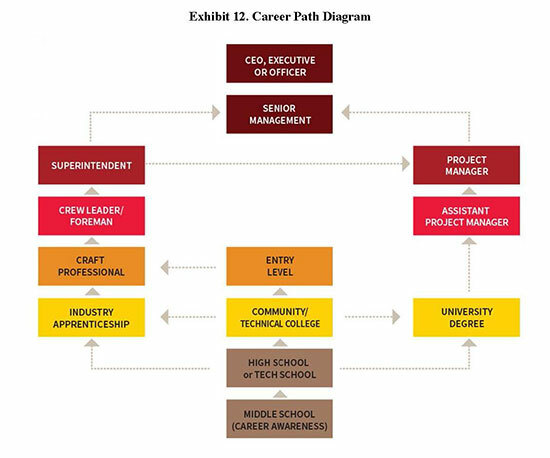 Exhibit 12 is a career path diagram used by NAHB’s Education Department. According to NAHB’s 2014 Single-Family Builder Compensation Study, the average annual wages plus bonuses was over $75,000 for Project Managers and Production Managers. The NAHB study also showed that benefits such as paid vacation and sick leave, health insurance, and 401K plans are common for employees in these construction managing categories. Annual earnings in the OES do not include benefits or non-production bonuses. Among the executive positions in NAHB’s compensation study, the one most closely tied to experience in the construction trades is Vice President of Construction. About a third of the single-family builders in that reported having a Vice President of Construction in 2014, and the average annual earnings for this position was well over $100,000. If the young adults responding to the NAHB poll had to look for a job, 60 percent would try to find information directly from the websites of the companies they are interested in working for. More than half would try career/job fairs (56 percent), asking friends/relatives (52 percent), and national/local job websites (51 percent). 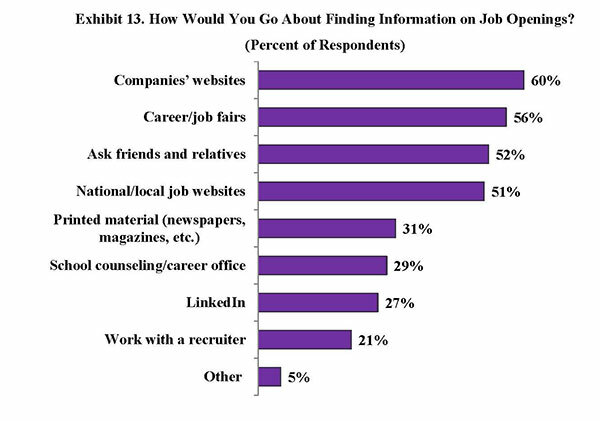 On the other hand, fewer than one-third (31 percent) would go about the job search by looking at print material (newspapers, magazines), by visiting a school counseling office (29 percent), on LinkedIn (27 percent), or by working with a recruiter (21 percent) (Exhibit 13). The vast majority of young adults between the ages of 18 and 25 do not see themselves working in the construction trades. The small minority that want to have a career in this field came to that choice mainly because it is what they are most interested in or it is where their skills lie. In their opinion, the two most important benefits of a career in the construction trades are good pay and the acquisition of useful skills. Most young adults who have yet to make up their minds on a career see very little chance they would join the trades even if the pay was high. This decision is based more on their view that construction work is physically demanding and difficult, and less so on often-repeated presumptions that it is because they prefer ‘new economy’ type jobs, or because the work is seasonal or requires being outside in the elements. The helpful news for the construction industry is that many 18-25 year olds who in theory would not like to work in the trades would reconsider it for an annual salary of $75,000 or more. Although the average annual salary is below this for the trades relevant to the home building industry, $75,000-plus salaries are available for the top 10 to 25 percent of workers, and it may be worthwhile to make this more widely known. First-Line Supervisors of Construction Trades and Extraction Workers; Plumbers, Pipefitters, and Steamfitters; Electricians; Operating Engineers and Other Construction Equipment Operators; Brickmasons and Blockmasons; Construction and Building Inspectors; Tapers; Carpenters; Drywall and Ceiling Tile Installers; Glaziers; Cement Masons and Concrete Finishers; Tile and Marble Setters; Stonemasons; Carpet Installers; Floor Layers, Except Carpet, Wood, and Hard Tiles; Insulation Workers, Floor, Ceiling, and Wall; Plasterers and Stucco Masons; Terrazzo Workers and Finishers; Construction and Related Workers, All Other; Painters, Construction and Maintenance; and Roofers.